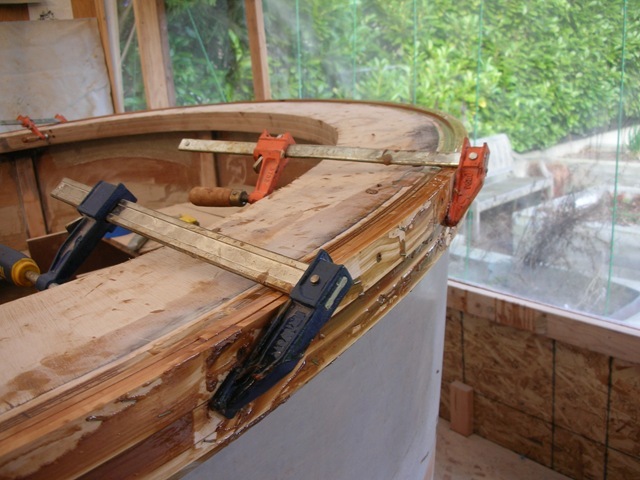 I’m working on the rubrail/gunnels of the boat. 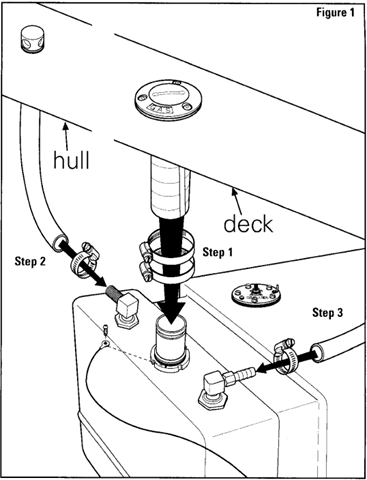 This involves designing the stern deck and the breasthook, and their attached parts. I really like this design because it allows you to stand in the very bow of the boat, to drop the anchor over or to grab the dock with the boat hook, or just to watch the water go by. 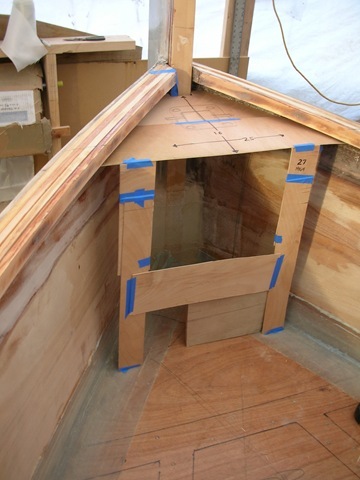 The whole gunnel will be capped by 1/2 inch plywood, radiused and glassed. Here’s the stern rubrail, laminated of thin strips to be the same cross-section as the side rubrail. 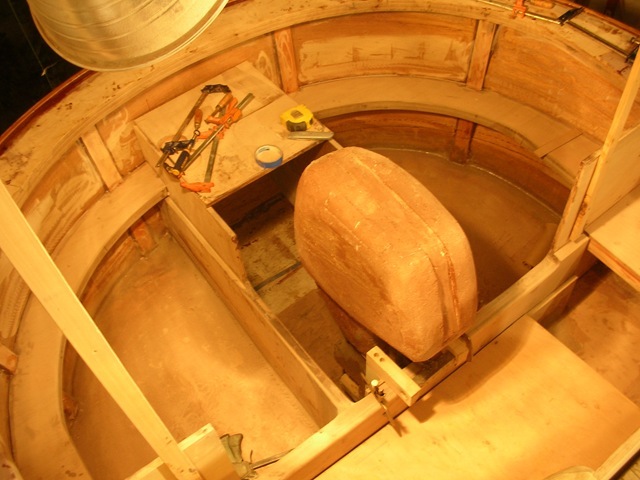 The stern decks will go on top, creating an open-sided lazarette on either side of the motor well. The lazarettes will hold the starting battery and the propane tank, along with the sundry stuff that needs to be stored. Along with the thickened epoxy, there are a couple dozen stainless screws and hundreds of Monel staples embedded. These strips really didn’t want to be tortured into this shape! Here’s the motor well so far. 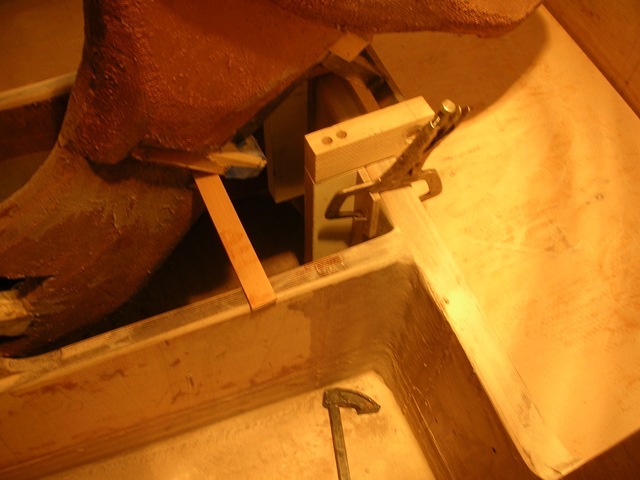 The motor mount is three layers of 3/4 inch ply above the sole, and four layers below. The sides are doubled 3/4 inch ply. 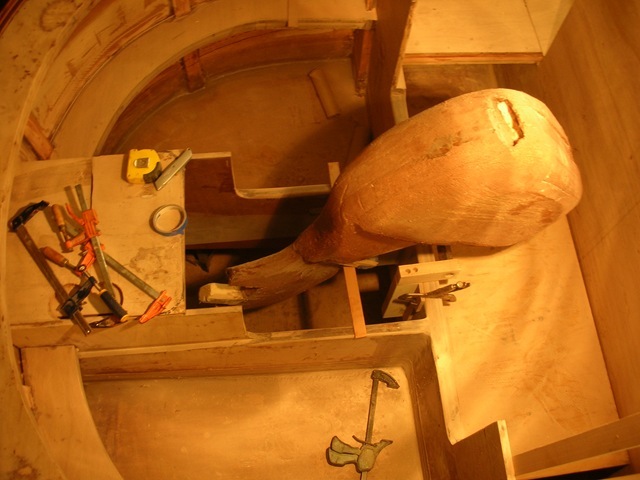 The 25-gallon gas tank goes under the sole just forward of the motor, with the fill and vents below the starboard deck, which will be made as a hatch. All the steering cables, electrical wires, and the propane tube will be through there also. The space will be vented below the lazarette covers, well above waterline in case the stern gets flooded. The plan is to finish the hull and decks and everything else I can do before starting the cabin. 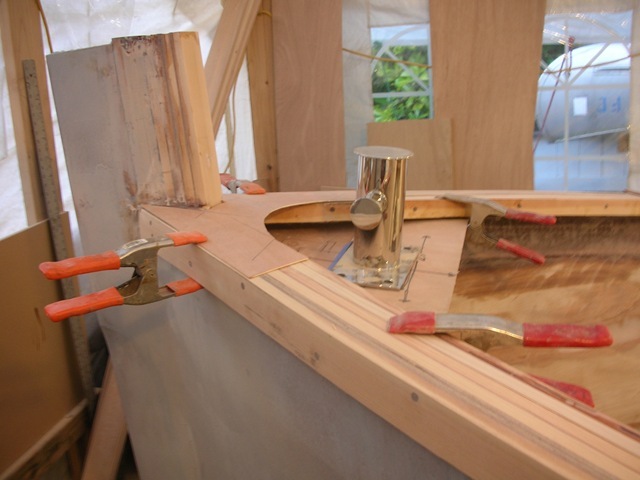 As soon as the walls start going in I’ll lose my work space inside the boat. By then it will be summer and I can cut parts outside. By the time the rains come in the Fall I’ll be doing finish work in the cabin. Update Jan 7 – the parts arrived. The bollard looks great! The tank actually fits in the space below the sole as designed. I found installation instructions on the Moeller site (PDF). I didn’t realize the tank could expand quite a bit when it’s filled with fuel – more than an inch in length!